constantly by the carbon products of my internet life. to read the newspaper which is still dutifully delivered to my door every day at 5am. just as I was 15 minutes before I fell asleep last night. and making more words and telling a story. and into a waterfall of endless ideas. and I have no intention of stopping anytime soon. into the keys as it comes falling down to my desk. And if I do, I won’t care. will not stop and I doubt that I ever will. but only if I work from sun up till sundown. some great feat even though it’s just typing. after the moon has graced us with its presence. when its 2am and I am sipping on some sort of fruit juice. to other people as they read them. I will just do it all over again the next night. and no one will buy it. and your life that isn’t what you want it to be? and you will want to live for more than just that other person? and will soon be forgotten after I die. and felt the sense of urgency that I am supposed to feel for the day. to keep your promises about subjectivity and serenity? about what it is I have done in this world. While the first book definitely had a handful of synchronized moments that were never truly meant to sync up in any formal way, I have decided to continue to explore this interesting and not often studied phenomenon. I liked the feel it gave to a couple of scenes in the last story so I want to see how far I can take the concept without it making the story seem to stylized and hokey. For those of you that are unaware of what Synchronicity is, I will reference Wikipedia: Synchronicity is the experience of two or more events, that are apparently causally unrelated or unlikely to occur together by chance, that are observed to occur together in a meaningful manner. Some may try to form a relationship between Synchronicity and irony, trying to see them as the same thing. However, they are both independent of each other and have different meanings. While irony is usually seen as an unexpected occurrence or result somehow related to a particular happening, Synchronicity is the coming together of events that, while unrelated, appear to provide a singular meaning as they seemingly mesh together to provide one outcome. Some people have looked upon this subject as a sort of ESP or intuition. I will provide an example from the book. In one particular scene, the character Emily is sitting on a bench outside of the store where the character John works. John is off that day, yet Emily is still there, thinking about him. John, who happened to be near his job on that day, decides to go by to see how things are going at the store. As he approaches the shop, he sees his friend Emily sitting on the bench. While neither of them expected to see the other there that day, somehow they both managed to be there not only that day, but also at the same time. You can see this sort of occurrence as coincidence, but you also have to wonder about the math involved: what were the chances that Emily, who knew John wasn’t working that day would be there at the exact time that John would just happen to think about going to the store to check on his co-workers be? Also, at that time in the story, Emily and John are having a very difficult time concerning one another so the likelihood that they would run into each other was very low. They both knew that they needed to eventually see each other to work things out, but hadn’t figured out a way to see to its happening. Given the circumstances, it’s hard to call this simply a coincidence. One might even call it fate. Maybe they were supposed to have met that day in front of his store so that they could find a way to solve their personal problems with each other. The meaning behind the meeting is quite evident, however no plans were made to meet in that way, and there lies your meaningful manner. I am looking to use this in my next work which is already in chapter two. I am also looking to use other literary tricks as well, seeing as how my first book was relatively straightforward in manner. I want to get this work out as soon as I can as I am very eager to complete the story which is already finished in my head. 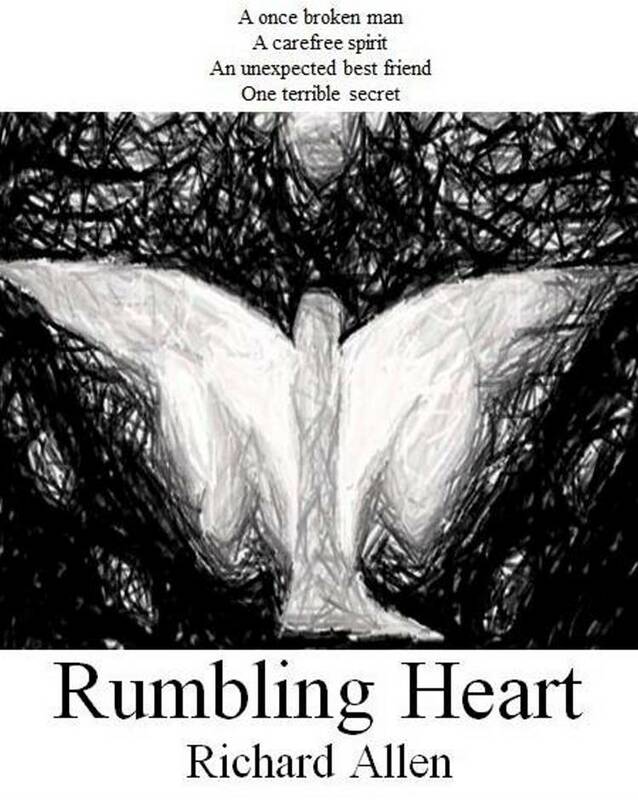 Amazon.com is currently offering the first 4 chapters of Rumbling Heart as a sample before you buy. If you decide that the book is worth purchasing, it can be done for a very reasonable $5.99 with free wireless delivery for Kindle users. If you do not have a Kindle, you can still purchase the book and read it on any computer using the free Kindle app from Amazon. Barnes and Noble also offer a free sample for their Nook device. Their sample is smaller however, and only gives you a little less than 2 chapters. The online price is also $5.99 with them. They also offer free software to download to any computer so you can read the book. Most popular eReaders can handle either format so owning a Nook or a Kindle is usually not required. Thank you again for the support and I look forward to the feedback. as if the ocean were looking for tourists that day. and looked into the water for fish. and took in the scent of the sea and a gust of wind blew my hair back. and ate away at the rocks lining the seawall. of a child and they yelled out to their father to help them cover their face. but failed to tell me where to find it. Because I am without you. A simple challenge, or so it seemed. Two fragments move forth in present tense. Today, a dream that I’ve dreamed since I was young finally came to fruition. I have , on my own, written, edited, and released a book, completely of my own creation. While I admit I am not Hemingway when it comes to writing novels, I would like to think he would have looked over my book, gave it a good once over and said to me “That a decent start, kid. Keep writing.” Unfortunately, Ernest isn’t alive to give me such positive feedback, so I am having to look elsewhere for readers and honest opinions. I know I’m not some amazing writer who is going to change the world. Hell, I may not even make you think twice about rereading my book once you have it in your possession, but I hope I can at least entertain you and stimulate your mind, if even for just a few nights while you make it through my novel. I’ve spent countless hours and many late nights working on the words and the text and the idea behind my work just so I can make it as perfect as I can just so I can release and look at it and tell myself that I did it. I really did it. I cannot say how many times I’ve broken down in tears while writing and editing this book as many of the supposedly fictional scenes do have real life events intertwined in them, many of which I would rather forget, but for reasons I cannot understand, never seem to leave my thoughts. I am sick and I know I am. That shouldn’t keep me from leaving a mark on this world though. I keep telling myself every single time I wake in the morning that I should give it at least one more go around, just one more try. Just one more try before I cash in my chips. Just one more try before I call off the search. Just one one more try before I hear my exit music begin to play. I am putting a lot on the line here and I am done hiding behind a fake smile and false positive emotions. I hide it all from everyone, even my family. They see me and they think I am ok, when I know I am not. For all I know, maybe they know I’m not ok and that’s why they keep me around. I still cannot shake those events from December of 2009 and it haunts me every single day. It will always haunt me, but it will not define me. I want to leave a mark, a legacy before it’s all said and done with. With these characters I’ve created, I hope to do just that. John, Olivia, Emily, The Chris’s, Donna, Stella, Paul, Audrey…they are all a part of me in ways many of you will never understand. While they all, within my work, define what it is to be human, they also show us a side which I wish we could all live up to. While we move through our daily routines and go to our jobs, raise our children, go to our schools, we all, if even for a short moment in time, wish we could be the best person we could possibly be. We all wish the person we were at our best would never leave. We all wish to be the greatest parents to our children. We all wish to be the children that we know would make our parents proud. We all wish to be the husbands and wives, girlfriends and boyfriends that our partners have always wanted. We all wish to be the best friends we could be, letting our friends know that they could come to us for anything and at anytime and never be judged. However, we all know that this isn’t how the world really works. In the real world, we seem to casually wade through our lives, looking out only for ourselves and never looking back to see the people that we’ve stepped over to get to our final destination. While some of you read this, you all will surely say to yourself “Well, I’ve never done that…,” but sadly, we all have. We get angry over things that do not matter. We sweat the small stuff. We yell at our kids and our friends and our spouses. People lose their jobs and are forced out of school. Parent’s abandon their kids and children disappoint their parents. Our friends get into that car even though we know they’ve had to much to drink, and yes…sometimes our friends lose control of their car and destroy a family on New Year’s Eve. It’s been said that we are the sum of all the people we’ve ever known in our lives and maybe that’s why I am still going. Maybe that’s why I’m still writing. Although I cannot remember many things from my childhood, there is still something pushing me to write and to speak and to talk about what I cannot recall. Maybe this was the way it was supposed to be. Maybe I was supposed to die when I was a child. Maybe I was supposed to die when my ex wife held that gun to my head, and maybe I was supposed to swallow all those pills in 2009 while all those voices steadily urged me to kill myself. I release a book, and with it, I release myself. I release all those feelings that were supposed to have died within my trembling soul all those years ago. I know that this was what I was meant to do in this life. For so many years, I asked myself “What’s this life for?” Now I know. It was to think and to feel and to smile and to laugh and to hurt and to cry and in so many ways, I’ve already loved more than I could possibly love in an entire lifetime, but I’ve also died a thousand deaths. Each night, just me and my keyboard, the pain bleeds out of my hands as I write. All of those long nights have finally produced something of value. And with no cheers and no fan fair, I present to the world my Rumbling Heart. Smiles are plentiful and all around. Souls can be no bother.